Finding and choosing the perfect photo personalised gift has never been easy. Find your personalised gift idea in our shop at alicesshop.com with this original, special teddy bear, personalised teddy bear at your standards. Find here our soft and cuddly Personalised Teddy Bear with the picture of a special person, which makes the perfect personalised gift idea for Mother's Day or the perfect personalised soft toy idea for any special occasion for that special person in your life. Our Richard the personalised teddy bear comes with its own gift bag which makes your personalised gift idea even more special. Richard the Teddy Bear Photo is 9 inch tall, beige colour and has a pretty red ribbon around his neck. The personalisation process is pretty straightforward. All you need to do is to provide us with a link for your picture for the tshirt or alternatively, you can email us the picture at orders@alicesshop.com. We aim to reply within the same working day and we will provide you with a copy of your personalisation to ensure that you are happy with the final product. Perfect gift idea for any age. Mothers Day teddy bears at alicesshop.com. 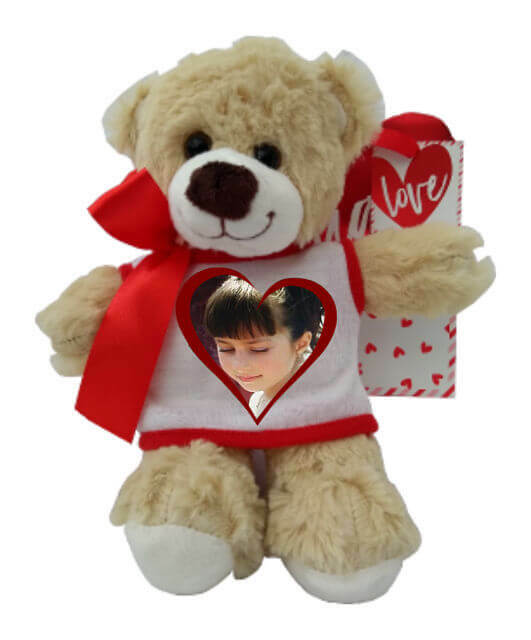 Make that special mother or the unique person in your life very happy with this personalised teddy bear, crafted at your standards, with our care. Our personalised teddy bear is for hand wash only, to preserve the unique design many years to come or... to the moon and back!